Emirates and Qantas have called for the Australian Competition and Consumer Commission (ACCC) to remove any restrictions on trans-Tasman routes as part of an application for their global alliance to be reauthorised. The pair is seeking a five-year renewal to its existing partnership covering destinations in Asia, Europe, Oceania, the Middle East and North Africa that was established in 2013. In its application to the ACCC, the two carriers say new nonstop flights from Auckland to Dubai (on Emirates) and Doha (on Qatar Airways) had reduced the volume of connecting passengers between Australia and New Zealand. Figures in the application show there had been a 13 per cent reduction in connecting traffic between Australia and New Zealand as a consequence of these new long-haul services, among other factors. For Auckland-bound passengers, the decline totalled 20 per cent. “Qantas and Emirates expect this trend to continue as carriers add more direct services to and from New Zealand in the future,” the application says. The applicants say the overall market average seat factor between March 2016 and April 2017 on Australia-New Zealand routes was 70 per cent. The Dubai-headquartered Emirates dropped its Sydney-Auckland services in July 2017, and in March 2018 will reduce its trans-Tasman operations further when it ends Brisbane-Auckland and Melbourne-Auckland A380 flights. Its sole Australia-New Zealand flight will be a Sydney-Christchurch offering. In their place, Qantas has boosted its schedule across the Tasman, scheduling extra flights from the three east coast capitals and upgauging some Boeing 737-800 narrowbody flights to Airbus A330 equipment. “The additional Qantas services on the Tasman will deliver enhanced connectivity and improved schedule choice for point-to-point passengers, which will be particularly valuable for business travellers,” the application reads. The applicants say Emirates would have accelerated the withdrawal of its Australia-New Zealand flights were it not from the support it received from Qantas as part of the alliance. When the ACCC approved the alliance in 2013, it included a condition the two carriers maintain at least their current level of capacity on four overlapping trans-Tasman routes. At the time, Qantas and Emirates accounted for about 65 per cent of total passenger capacity between Australia and New Zealand. The ACCC said in 2013 it was concerned the alliance would have increased the ability and incentive to reduce or limit growth in its capacity in order to raise airfares. Now, with Emirates all but out of trans-Tasman flights and with a Dubai-Auckland nonstop flight of its own, as well as increased competition from fifth freedom operators and capacity growth from other airlines, the pair argue any capacity condition on overlapping Tasman routes was no longer needed. “Continued compliance with the condition has limited critical operational flexibility in a market characterised by deeply seasonal demand and [REDACTED],” the application says. “Going forward, the applicants do not consider an ongoing capacity condition to be necessary or appropriate, particularly in circumstances where the proposed conduct underpins Qantas’ backfill of Emirates capacity that will otherwise be removed from Auckland. More broadly, the application says the alliance had delivered “real and substantial benefits to Australian consumers”. 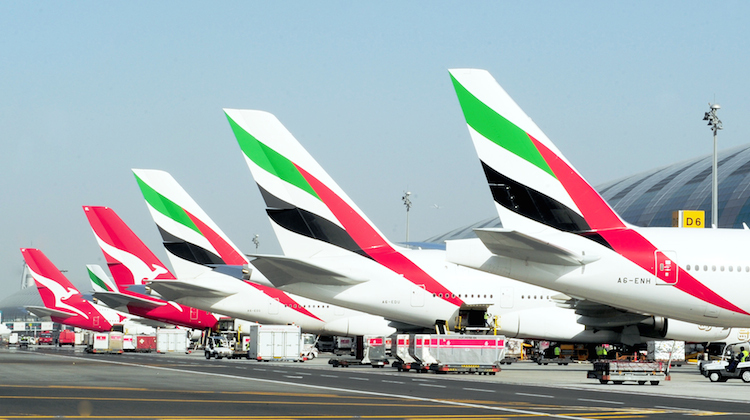 Further, the increased passenger volumes on Emirates-operated services to Australia had “expedited capacity expansion” by the Dubai-headquarted carrier, including the upgauging of some services to the Airbus A380 and increased frequencies on existing routes. The Emirates partnership had also assisted Qantas’s international business to “grow in a sustainable way in a global market” where the Australian carrier is disadvantaged as an end-of-line carrier compared with airlines with mid-point hubs in Singapore, Hong Kong, the Middle East or China. “The alliance has not in any way provided the applicants with an ability to artificially increase airfares or restrict capacity,” the application says. The application also shows Qantas’s frequent flyer members redeemed 469,593 passenger segments on Emirates flights since the alliance began in 2013. By contrast, Emirates Sykwards’ 18.2 million members redeemed 70,559 Qantas-operated passenger segments in the same period. Passenger traffic on the two carriers’ joint-network has also grown as the alliance matured. The application says the number of passengers travelling on the combined network had doubled from 1.1 million in 2013 to 2.2 million in 2016. More specifically, the application says 527,000 Emirates passengers flew on Qantas’s domestic services within Australia between July 2014 and April 2017. Darwin would be the perfect stop over for passengers going to Dubai or Auckland. the route would be great for the 777 as each sector would be 7-10 hour flights. They could also pick up locals and tourists to either Auckland or Dubai and we won’t have to go to Sydney or Brisbane to get to Dubai. But does Darwin have such a large numer of people who would go to either Dubai and beyond or New Zealand that the routes would be viable? I thought that this is the reason that Darwin has such limited international flights—just not enough demand. When you look at population thresholds the most under-serviced airport in Australia is Newcastle. Darwin has a small population base and a dry season tourism trade. Newcastle Airport offers close to one million potential passengers within an hours drive to Williamtown Airport. maybe Emirates could relocate a B777 to a thrice weekly service to Singapore and Dubai. Darwin would be to small for Emirates. Newcastle yes is undersevered however Emirates probably wont fly their any time soon due to no current international services, no aerobridges, and i don’t think they can fly directly from Newcastle to Dubai with a full load. At most Emirates will just upgrade existing services before adding new cities in Aus. And if they were to add more services to Aus it would most likely be the Gold Coast or Canberra. But theses are even unlikely since they probably cant fill a daily 777 to Dubai (Emirates really only wants to fly routes with daily demand). I reckon eventually Sydney to Christchurch will be on the chopping block. Newcastle doesn’t have the international facilities nor the tarmac space for B777. The runway has been extended to around 10,000ft so a fully laden B777 could depart heading to the middle east. But if we’re thinking long-term about Newcastle as a potential possibility, we can’t forget that Emirates seems likely to order a few A350s or something like that in the future. The other point about Newcastle is that it is predominantly a RAAF base. You can’t ramp up civilian traffic without impacting on the RAAFs ability to train and the knock on effect to defence capability and national security.